Keep your pal’s nails trim safely and easily with the Polly's Pet Products Corner Bird Perch. It’s designed to fit perfectly on any corner of your pal’s cage and veterinarian recommended to naturally trim your bird’s nails and beak, with no effort on your part. The textured surface gently files nails as your pal walks on it, and the extra-long perch makes for a roomier perching area. Since it goes in the corner of the cage, it frees up more room for your pal to stretch his wings and stay active. Plus, it’s easy to install with extra sturdy mounting that attaches to two sides of the cage, and comes in a variety of sizes to suit your cage size. Textured surface naturally trims nails as your pal walks on it to keep them healthy with no effort. Curved design is perfect for cage corners and allows more room in the cage for your pal to be comfortable. 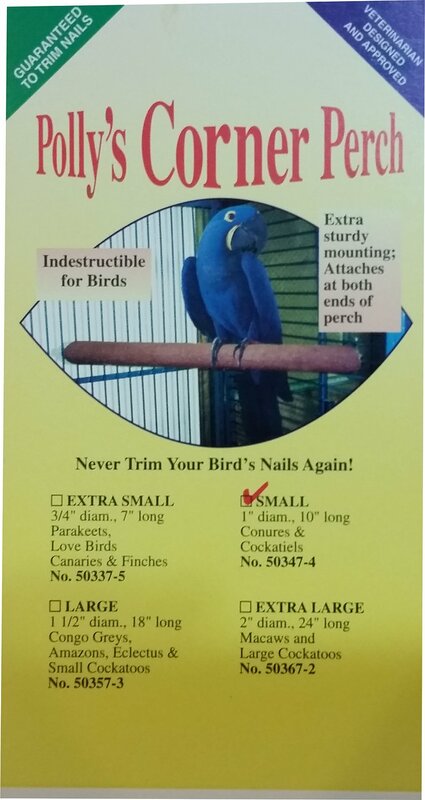 Recommended by veterinarians to keep nails and beaks trim automatically with no stress or hassle. Non-slip perch material helps maintain a comfortable temperature for your pal so he’s always cozy. Extremely lightweight and indestructible for birds, and is easy to set up in most rectangular cages. Soak in soap and water solution, then rinse thoroughly (some color fading may occur with bleach or dishwasher products). Attach securely between cage bars above existing perch; perch should be mounted at a 45 degree angle in a rectangular cage. Use one washer inside the cage, with the other washer and wing nut on the outside. If a plate is provided, loosen wing nut, then slip plate and wing nut through the cage bars and rotate plat 90 degrees, then tighten wing nut.